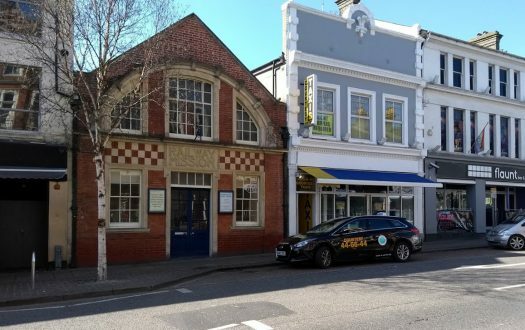 Photo: © Oliver Dixon and used under license Though the parish was founded in the 13th century, the present building dates from 1813 and was designed in the classical style by the eminent architect Thomas Hardwick. It faces one of the entrances to Regent’s Park, then a grand new suburb of London, the commercial and social success of which funded the new church. The tower of St Mary-le-bone (today written Marylebone) is topped by a circle of gilded classical ladies (architectural term: caryatids), a most un-Christian architectural motif that recalls the temple of vestal virgins rather than the mother of Christ. St Marylebone was given an interior makeover in 1883 with decidedly Italianate results, with mosaics and Renaissance embellishment, an impression further augmented by two very large crystal chandeliers that light the nave – a most un-English touch. Altogether, St Marylebone impresses by its scale and decoration. This seems to be a thriving parish with a thriving parish primary school attached. The newsletter and website suggest several parish organisations and weekday events. A parish outing to Westminster Abbey was planned, as was a pilgrimage to Walsingham Shrine, in Norfolk, England. 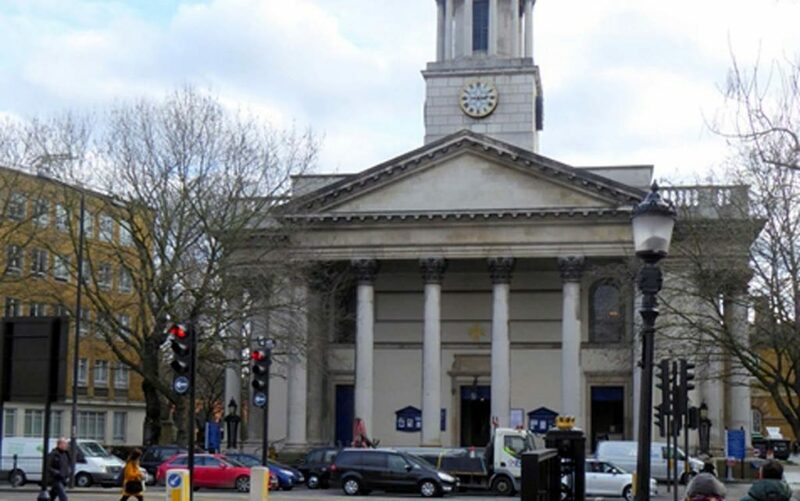 Though facing Marylebone Road, which is virtually an urban motorway, the church backs onto Marylebone village, today a very prosperous urban residential area. Marylebone High Street, adjacent to the church, is one of London’s choicest shopping streets. Local residents include a number of high-profile screen stars and, until her divorce, Madonna. 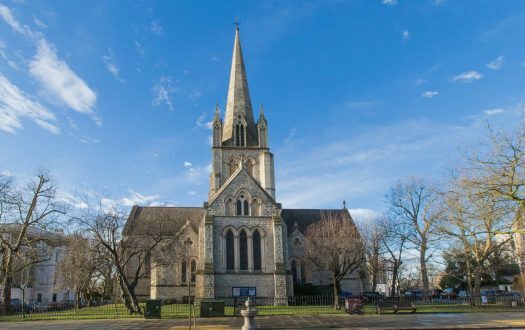 However, the church serves a far wider public than the well-heeled and well-known and draws its following from a wider radius, including areas of social housing north of the Marylebone Road. The vicar, chaplain (i.e. assistant priest, who preached), a choir of ten. Impressively full. 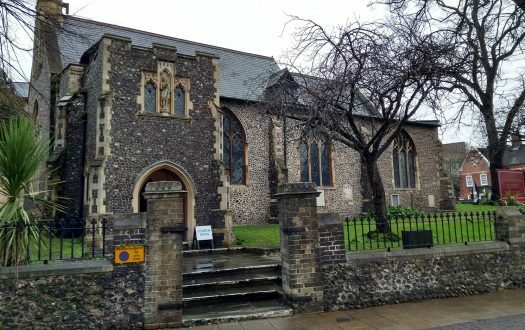 I would say 220, though in the time-honoured English tradition the congregation filled the pews from the back, not from the front, so there were some large gaps at the front. After the collect of the day the children all left us – I would guess 40 or 50 of them – for Sunday School, with some adults. The congregation were quite mixed socially, demographically and in ethnic origins, and there was an unusually large number of young families. If only one more often found such a broad mix at church. A greeter handed me the hymnbook, weekly bulletin and order of service. Yes. It’s a bit of a lottery whether a pew fits one’s shape and angle of recline – but this one suited me. Distinctly chatty, which is perhaps inevitable with so many children present at that stage of the service. New English Hymnal and the service sheets. Organ – a large modern instrument by Rieger-Orgelbau GmbH of Schwarzach, Austria, at the west end of the church. The capital cost and use of the organ are shared with the Royal Academy of Music, just across the road from the church. The prayers of intercession were several minutes long and very comprehensive – so that the focus of my intentions drifted. Common Worship, with traditional wording options taken. It was a middle of the road Church of England service, with a slight lean towards the liturgical end of the spectrum: vestments were worn, the priest processed with deacon and subdeacon, there was a gospel procession, and the action was embellished by a sung mass setting. There was no nave altar, so the eucharist was consecrated some distance from us. It was taken at a brisk pace and the choir of ten voices in the sanctuary gave excellent value. The setting was Mozart’s Missa Brevis, which can be disastrous to less confident singers than these. I noticed there were only two readings (no Old Testament) and the Kyrie and Gloria were run together. No incense. 8 — The chaplain (assistant priest) preached on the text of the day accessibly, clearly, and without recourse to theological jargon. Taking the gospel text for the day Luke 5:1-11 (‘from now on you will fish for people’), he pointed out that Peter at first refused Jesus' request to cast the nets again for fish, but that later he took Jesus’ word for it that he would reel in a catch. How difficult it is to admit God (he later said Christ) into those parts of our lives that we protect as private and personal, or perhaps find difficult: the nooks and crannies of our lives. In truth, Christ belongs there too, and Peter made the mistake for us. So let us not refuse to admit Christ into those places. The choir singing a setting of ‘Amazing Grace’ as a gradual. The arrangement was by Steven Grahl, a former director of music at this church (now director at Christ Church Cathedral, Oxford). The choir did it proud, and a tenor and soprano solo were especially moving. Not hellish, but the acoustics were a little challenging at times. The vicar hadn't switched on his mic, I guess, and was difficult to hear from the opening collect to the notices (the assistant priest's voice carried well in the sermon). The mic at the reading desk had severe interference so that much of the reading was lost. The floorboards under the pews squeaked at the slightest movement, and surprisingly loudly. Happily the choir were readily heard. The vicar invited us to stay for refreshments, and there was a great deal of post-service conviviality. I spotted a couple of people I knew but, as instructed, held back and looked a bit lost, in order to see what happened. I am glad to say that I was soon spotted as a new face and was then introduced to several other members of the congregation. Real, from a filter, in paper cups. Doctor says I must stay off caffeine, but it smelled great and was popular. Chocolate digestive biscuits on the side. I noticed a table with squash and cups for the children outside in the portico of the church. This was a slightly chilly day for squash al fresco, but it was nice to see the younger members of the congregation catered for, and in summer I bet it works well. 8 — Dignified liturgy, not overdone, and wonderful music. Lovely old building. My kind of church. The way children were well engaged and cared for at this church, comfortably alongside adult solemn worship.